This quote comes at the very beginning of ‘Moving Pictures’, the tenth novel in the series, and I pick it out because whilst it sums up the plot of this book well enough, it also essentially sums up the whole of Discworld. Discworld is over the top, silly, fantastical fun but, for all of that, it really does feel real. I think that for me personally, at this checkpoint in the series (number ten) this is the very reason that I love Discworld as much as I do. We know these people, or at least we know people like these people. Everyone knows someone who has a grandmother like Nanny Ogg. Everyone knew a gangly, clumsy kid like Mort at school. It is relatable, far more than any other fantasy novels I have ever read. ‘Moving Pictures’ is only the second standalone tale so far, but it also contains several characters who make what is by far their largest appearances, and several more who are by now regular guest stars. ‘Cut-Me-Own-Throat’ Dibbler, the Ankh-Morpork salesman famed for his questionable snacks and ability to appear absolutely anywhere that a crowd has gathered, makes his name in this story as a Holy Wood film producer. It’s a nice touch; of any character we have met up until now, Dibbler is the only one who you could see really being taken in by the Holy Wood magic, and the decision to promote him from bit-part up to main character for that very purpose suggests to me a respect for the characters and the readers who have come to know them so well. It gives Discworld an organic feel. This is also the first outing for Gaspode, the talking dog, who reminds me a bit of Rincewind in his ability to go about saving the world despite his best efforts not to do so. There is even a moment when you believe his sacrifice has killed him, much like with Rincewind. I suppose that their similarities could be read as a lack of new material rather than some genius invention but, then again, if Rincewind doesn’t fit in a story, why not have the dog version instead? Everyone loves dogs, especially the ones that talk. On the subject of heroic animals, now would be a good time to mention the Librarian, the wizard turned orangutan who guards the books at the Unseen University and who I realised during this book is far more important than he first seems. He is the only one who can read the book that Victor brings to him, the book that explains exactly what is going on with that pesky Holy Wood portal. In ‘Guards! Guards!’, he noticed the stolen book and helped the Watch find it, earning him an honorary position on the force. For someone who has a vocabulary of two words, ‘oook’ and ‘eeek’, the Librarian is a remarkably well-rounded and substantial character. For those of you who may have read my article on ‘Wyrd Sisters’, you will remember that I was particularly in love with the idea of theatre being ‘magic for ordinary people’. The thread of that theme continues in this story, when Ginger and Victor discuss why film has become so important so quickly; ‘You know what the greatest tragedy is in the whole world?’ said Ginger… ‘It’s all the people who never get a chance to know what it is they can really be. It’s all the wasted chances. Well, Holy Wood is my chance, do you understand? This is my time for getting…Magic for ordinary people, Silverfish had called it.’ To me, the repetition of those exact words seems to be a very deliberate choice on Pratchett’s part and not just a lucky coincidence; the specific themes of Discworld are really starting to develop and grow. 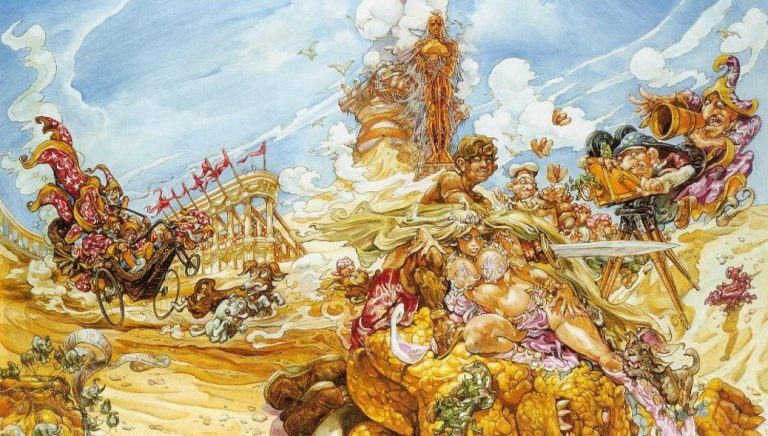 The organic development of Discworld that I mentioned earlier applies just as much to themes and ideas as it does to individual character growth. On a purely ascetic book nerd note, I have one final comment today. The copy of ‘Moving Pictures’ that I own is much newer than the others in these early stages of Discworld, and it is a much more pleasant book to read. The older versions do have the very distinctive covers, illustrated by Josh Kirby, but if you can sacrifice those drawings for a book that is larger and more comfortable to hold, with bigger type, then I would wholeheartedly recommend these versions, if you were considering getting hold of your own copies.